Balcony off the Dining area overlook the pool area. Patio overlooking pool area. Pool area also has a hot tub & grilling area for your enjoyment. Kitchen overlooking Family Room. Bar Area has seating for 3. We expect for you to sit back, relax & enjoy your getaway – whether you are here on vacation or work. You will appreciate this 2 bedroom, 2 bath lock-off condo that overlooks the Gateway Pool Complex. 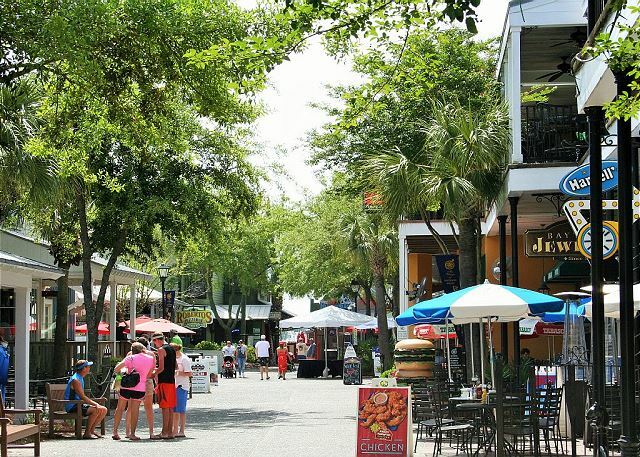 You are just steps away from the fun of the Baytowne Wharf area too! 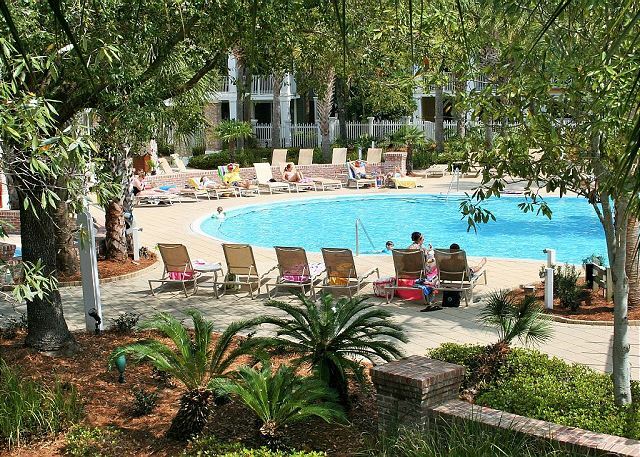 When you walk in our condo at MARKET STREET INN in SANDESTIN™, you will be taken by the lagoon pool view. It’s inviting blue waters & palm tree beckon you to take a dip. Spend warm summer evenings lounging on the oversized balcony taking in the tropical ambience! The kitchen is fully stocked… so if you want to do a quick snack or a full blown dinner…you will have everything you need. The kitchen seats six with additional bar seating for three more. Our master bedroom suite features a king bed, flat screen 40" TV & DVD player, and a master bathroom with dual vanities and a separate tub and shower. The guest bedroom features a queen bed and full sleeper sofa, 40" flat screen television and DVD player along with another bathroom. 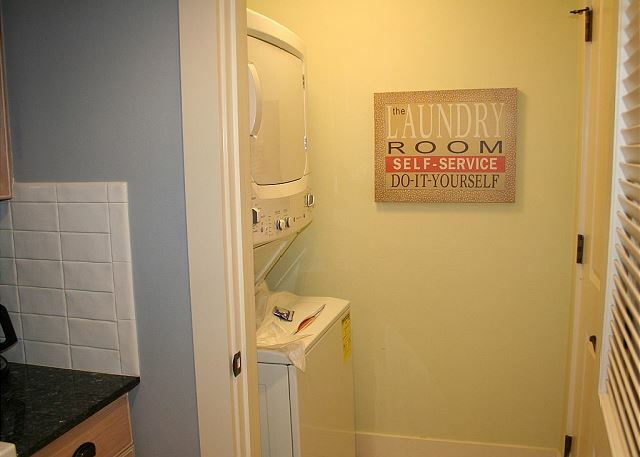 For your convenience, our vacation home offers a washer and dryer, free garage parking and complimentary WIFI. Resort transportation provided with this rental - Owner participates in the tram service. You will be able to use this during your stay at no additional charge. This service is not offered by all owners. If you feel transportation would enhance your vacation experience by not having to drive & deal with parking availability, you should seriously consider the advantage of renting this condo. DESTIN MEMORIES is an independent company that is not affiliated with, sponsored by or associated with any entity containing the word “SANDESTIN™.” any use or reference to the word “SANDESTIN™” is used in the factual sense to geographically identify a property or location and not to suggest any affiliation with any Sandestin branded entity, product or service. We had a great time at Crabby's Condo. The location is great! Close to the elevator to get to the car but also near the stairs to come down to the shops and eateries. Tricia was wonderful to work with, answered my questions and was always prompt with responding. We brought our two boys, ages 5 and 12 and having the two bedrooms was a blessing. They had their wing, we had ours and when someone wasn't feeling social, they could escape to another part of the condo. Perfect!! Oh and did I mention the view?? Right over the pool. Awesome! At first I was worried about noise, but we never heard a thing. And it was great to have my coffee out on the back porch. Loved staying at Crabby's. Hope to stay again! Thank you Tricia! It was an absolute pleasure! You are right, the view can’t be beat and very convenient for families. I hope to host you & your family again. Great location right by the pool, quick walk to Baytowne. Kids had a great time and my daughter enjoyed having her own room with her own sofa. We took the tram over to the beach once, but it's not a bad drive, so we drove over there most of the time. 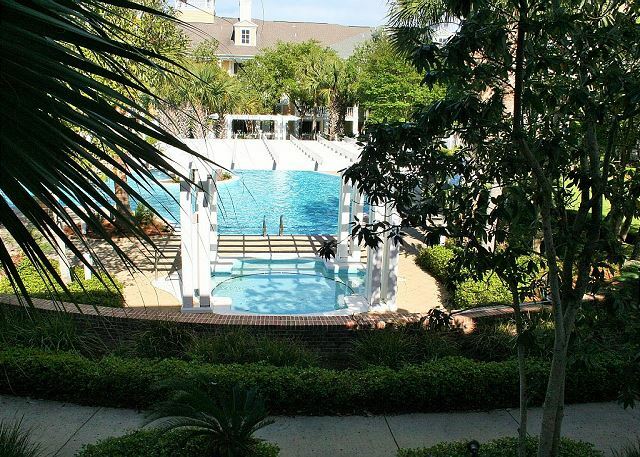 Very nice condo conveniently located in Baytowne Wharf and overlooking resort pool. Nicely decorated with comfortable beds, nice TVs, great WiFi, and everything you need to prepare & serve meals. The private parking is very convenient and secure. Would definitely stay here again! Great place, second time staying there. Crabby's Condo is super cute and we always love to stay in Baytowne Wharf. The beds really do need to be replaced so we would just encourage the owners to go ahead and do that to provide for a more comfortable stay. Great location and decorated very cute. Thank you for the recommendations. We appreciation your attention to detail and will get those items updated. We look forward to have you stay with again in the future! Working with Tricia at the last minute to book our trip was very easy. She responded quickly via email. We had a wonderful time! The unit was in a great location within Baytowne Wharf, had a beautiful pool view, and the decor was very nice. Thank you for the coupons to a couple of the restaurants in Baytowne Wharf. They came in handy. We never used the tram, but it was nice that it was included if needed. We were close to shopping, fine dining, and a Publix grocery store right outside the entrance gates. No crowds in October which was great. We would definitely stay here again if the conditions remain the same. It was a pleasure to have you come & stay! I hope to see you next October! The condo was perfect! We loved the location. It couldn't have been better and we will rent this same unit in the future. Thank you for staying with us! You are right - you can't beat the location! We hope to see you again in the future. We absolutely loved this place from the time we walked inside to the second we left - we could tell it was very clean and my kids absolutely loved the view of the pool. They layout was perfect for our family of four! I received a quick response each time I emailed or called- and they even went above and beyond! I accidentally left my entire case of jewelry (wedding rings and many other valuable pieces) in the bathroom drawer. We realized about 1.5 hours away. I called and someone went and picked it up and delivered it to a friend staying across the street! We will definitely stay here again! Thank you for the great review! You can't beat the location overlooking the pool area. We take pride in our customer service and are so glad that were able to experience that first hand. We look forward to having you and your family come stay with us again! We had an awesome time. The Birthday Girl enjoyed all of the different things for kids to do. The adults enjoyed all of the food options. The Condo was nice and clean. It was cozy and quite. Condo was very clean, nicely decorated, and well stocked with needed essentials. Large balcony with pool view. Great area, walking distance to restaurants and shops. Free shuttle transportation to local beach. I would definitely recommend this property. Great condo, very clean and would rent it again!! One of the best vacation rentals ever. Best rental agency ever. Wish I could give more than 5 stars. Thank you! It was our pleasure to work with you. I hope that you will come back & visit us again soon! We were all happy with the Condo. We all really enjoyed the condo. Very comfortable and the best part was the covered porch and view of the pool. I don't think we ever turned the TV on. Only thing I was disappointed in compared to other condos. Was that there was no hand soap in the kitchen where you are cooking, no dish soap to wash up dishes and only one small packet to run a single load in dishwasher as required. Only one trash bag was provided and learned there are no starter coffee packets provided. So ran down to the store to buy what was needed. Otherwise really pleasant stay and seemed very clean. So glad you enjoyed your stay. I also love the view of the pool area - it's like a tropical oasis and NO TV in this day & age is RARE! Thank you for your comment about the supplies. Since it is a condo we normally only provide a start-up supply of items such as toilet paper, paper towels, garbage bags, etc. Enough to make it to the grocery. This is noted in the welcome letters that I send out to my guests. I am sorry that it was not clear as I am sure that you would have brought the supplies from home instead of running to the grocery. 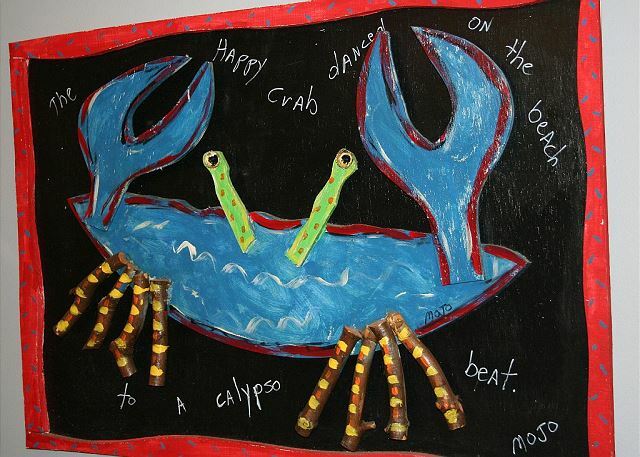 Once again - many thanks for staying at Crabbys! Staying in the crabby condo was great! Plenty of room, very clean, relaxing, and very comfortable. We loved the location bc at night we were minutes from all the fun. Our older kids could go off on there own. Can't wait to go back! And the beach was gorgeous! The condo was perfect! Very clean, comfortable and beautifully decorated. Perfect location right in the heart of the village. So glad to hear! Hope that you will come back to visit again soon!!! We had a a great time and so enjoyed the unit and all that was included (very well appointed). We didn;t go to the beach but nice to see 2 chairs were available to bring for next time. It was clean comfortable and very clear and friendly directions on how to get in, how to leave the unit, and who to call if you need anything! ONLY thing I would suggest is a little softer sheets and towels but they were fine and clean. So glad that you enjoyed your stay & hope that you will come back again & use those beach chairs!